For the word of God is alive and active. 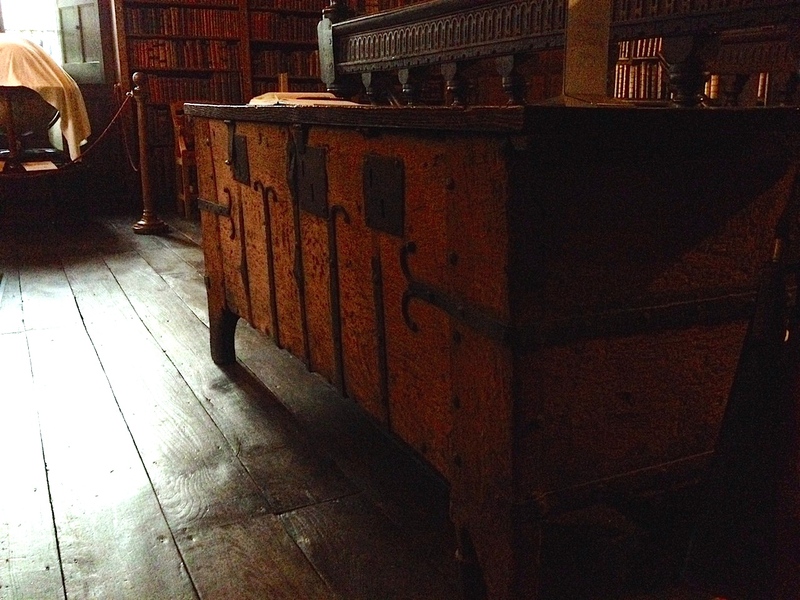 Sharper than any double-edged sword, it penetrates even to dividing soul and spirit, joints and marrow; it judges the thoughts and attitudes of the heart..
A friend of mine recently sent me a link to an article called Chain, Chest, Curse: Combating Book Theft in Medieval Times. The article was a really fascinating look, as the title suggests, at the various ways the owners of medieval books kept their valuable volumes safe from sticky-fingered book thieves. Books in medieval times were big-ticket items — priceless, for all intents and purposes. They had to be protected, while still being useful. And so the chains, chests, and curses of Erik Kwakkel’s article. 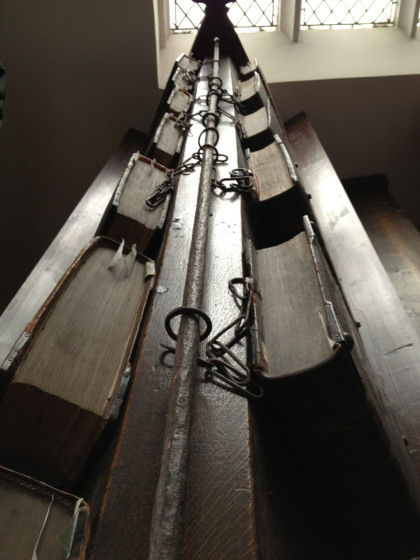 Books were most commonly just chained into their bookshelves. 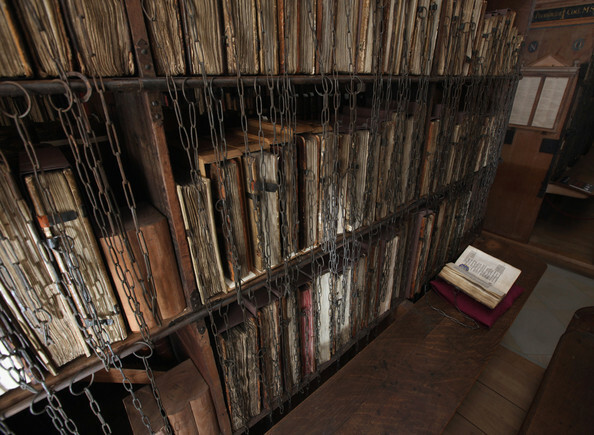 A few “chained libraries” still exist in the world, but not many. They’re just what they sound like: rows of bookshelves, with thick iron chains running from them to the wooden binding boards of the books stored in them. The chains have enough slack that the books can be removed from the shelves and perused, but they can’t wander away. But there was a third method of keeping your library safe: curses. Sometimes, owners of books simply wrote a curse in the book itself. They might take a form like this: “Whoever takes this book or steals it or in some evil way removes it from the Church of St Caecilia, may he be damned and cursed forever, unless he returns it or atones for his act.” That church took book theft pretty seriously, apparently. All these measures for safeguarding books make a key assumption: that these books needed protecting. Reading the article, I remembered that medieval Bibles were often protected in the same ways: chained to pulpits in churches, locked away in chests, even inscribed with curses. That’s because they were at least as expensive to produce and purchase as other books of the time. It’s easy to understand why people felt that those Bibles needed protecting. Leather and paper and ink aside though, the Word of God has never needed protecting. And yet we still have that impulse. And we need to resist it. We have to resist the impulse to bind the Scriptures with the chains of academia The Bible shouldn't be bound to the shelves of dark libraries, locked away from the world by the scholars who study it, translate it, and interpret it. Understand, I believe scholars have done a great service to the world through their work on Scripture. Because of their work, we have a largely agreed-upon standard edition of both the Old Testament and New Testament. Because of the work of scholars, we know more about the world of the Bible than we ever have. Because of the work of scholars, we can read the Bible in our own language — almost every language on the face of the earth, in fact. But the word of God belongs where it has always been found: out in the world, not locked up in University libraries. There has always been a tendency in the church to make the teaching of the Bible exclusively the work of trained academics. Thankfully, it’s easy to break those chains. Just don’t allow the scholars to tell you what the Bible says. You might not have some of the training and tools of the scholar, but you’re an expert in something no scholar is: what happens in your heart and mind when you and Scripture collide. No scholar can tell you what’s supposed to happen in that collision, nor can he arbitrate an interpretation to you after the fact. The good ones won’t want to. Neither, however, should Scripture be shut up in stuffy chests of personal interpretation. While you are the expert on your own encounters with the Bible, your own encounters are not the last word. The Bible has always been, and should always be, the property of the church together. Every time someone has misused Scripture to coerce, manipulate, or support a personal agenda, they have done so by making their own personal reading of Scripture into orthodoxy. We need to read together because we need voices other than our own talking about their reading of the Bible. We need people who are different from us telling about their own encounters with the Word. That’s how we check, correct, and confirm our own readings of Scripture. We read it in community, in the community of people who have been and are being formed by the power of the Word of God. We read it in the church. And not just our own little enclaves: we read it with the church through the ages, different communities in different times and places who believed in the power of the Word to create brand new worlds, and longed to let it out of its box to do just that. But reading the Bible with the church doesn't mean that we superstitiously cower before the curses that religious tradition places on new, different, or subversive readings of Scripture. Don't imagine that the Word of God has been definitively decoded by the generations that have come before. The history of the church can be told in the forgetting and rediscovery of biblical truth. While the established church may cry “Heretic!” and “Anathema!”, people who take the Bible seriously have always kept the fresh winds of the Holy Spirit blowing through stuffy ecclesiastical halls. Why would we expect any less? The Word of God, of course, has never been just a book. It is his creative and redeeming power, represented (but never completely captured) by the written word on the page. So read it. We have greater access to the Bible today than any previous generation in the history of the world. And we probably read it less than any previous generation has. Don’t be surprised if your church isn’t what it should be, or your family, or your own character, if you don’t read or hear the Bible often. But don’t just read it, like you read a newspaper or a novel or a cookbook: confront it. Encounter it. Wrestle with it. Wrestle with it on your own, and with people you love. Don’t take the “official” interpreters at their word: take God at his Word. Expect it to be alive, expect it to cut deep, and open your heart to its work. We don’t need to protect the Word of God. If anything, we might sometimes want to be protected from it.